Now Shillongites are taking a lesson or two on traffic rules. 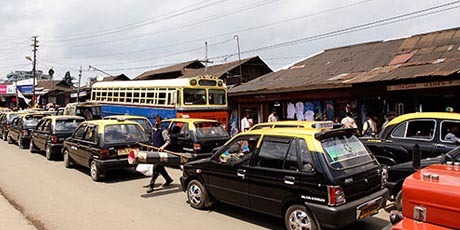 With the traffic getting highly troublesome, thanks to rapid increase in vehicles, the pedestrians find it hard to cross the roads or even walk carelessly which was, as a matter of fact, a way of life in Shillong. The Traffic Branch of Meghalaya Police in East Khasi Hills district haven taken up the mantle of educating the pedestrians and the motorists about the use of the zebra crossing. The traffic police personnel along with groups of students and volunteers from NGOs have drawn up a slew of plans to ease traffic by encouraging the denizens to abide by the law and proper use of the zebra crossing. Particularly the students’ community and the guardians are sensitized on the matter, as things worsen to new heights during school hours, both morning and afternoon. Leaflets containing the ‘dos and don’ts’ for the pedestrian and motorist were also distributed on the streets of Shillong during the last couple of days. This was done in compliance of the order passed by the Chief Justice of Meghalaya High Court based on a PIL filed wherein the PWD were asked to put zebra crossings in vulnerable areas and the Police Department to create an awareness. The same kind of awareness campaign has also been launched through television and radio as they are the powerful mediums reaching out to larger polulace. Personnel at every police stations, beat houses, outposts and the police reserve have also been directed to sensitize all personnel working under their control.